What made the experience of listening to Obsidian Butterfly the most enjoyable? 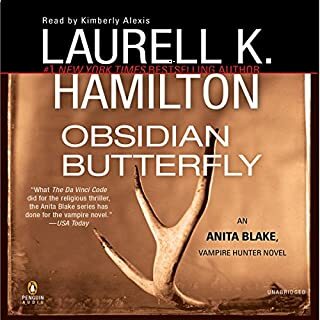 I'm a fairly new listener of Anita Blake series (i'm currently on book 10 Narcissus in Chains) and I have to say that this was not as good as the others one were. Overall it was a good book, but I've become so accustomed to the Anita Jean Claude and Richard triangle that not having it in this book kind of set me off. Overall the storyline was good and we got to see a lot more Anita action independent from her growing "new and improved" abilities. What does Kimberly Alexis bring to the story that you wouldn’t experience if you just read the book? I'm sick and tired of Anita being so ridiculous sometimes. She needs to cut the crap and just stay with both of them. I hate that she loves Richard and isn't afraid to admit it, but Jean Claude she is always hesitant about. She loves them both, but she is always so weird about her feelings for Jean Claude, it makes me so maaaad!!! !